Deadman’s Lament- a Western novel of Retribution and Revenge! Dead Man’s Lament already boasts over 89- 4 and 5 star reviews! It is also nominated for the RONE award for western fiction, the Global E-Book award and is a FINALIST for the Western Fictioneer’s PEACEMAKER AWARD! Settling an old score held Matthew Wilcox in a haunting grip that prevented him from love or finding peace in Deadman’s Lament. Linell Jeppsen unravels the story of a boy who lost his parents and his home at an early age and then found a new home and developed a strong bond with the daughter of the family that took him in. The French couple who had taken him in and loved him as their own were gunned down by a ruthless killer called Top Hat. His childhood sweetheart was stolen away by a Nez Perce chief who had been tracking down Top Hat and had run across the party and killed three men who had been decent to the young boy. Seeing strong medicine in the boy, Redbird let him live and Mattie continued forward, fighting to survive. Finally found by his uncle, Mattie grows to become Sheriff Matthew Wilcox and sets out on the trail to exact vengeance on Top Hat and put his haunting to rest. 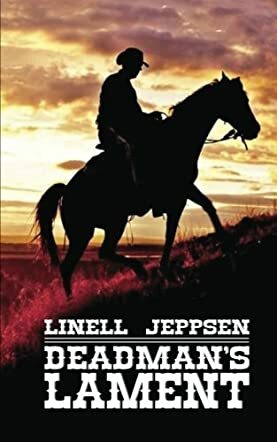 Linell Jeppsen has followed along in the shadows of some of the great Western writers of the past and delivered a solid story in Deadman’s Lament. The classic themes of good overcoming evil and survival through enduring fortitude, as well as romance, are well formed in this action-filled story. Plenty of emotion and the sense of doing right draw the reader into a deep empathy with the hero and keep you on the edge of your seat as you watch the struggle unfold for a young man fighting overwhelming odds against a strong and cunning enemy. Full of action and tragedy, yet revealing the dogged fortitude of the western spirit, Deadman’s Lament will send you on a wild ride where guns are blazing and good men will stand straight and tall in the name of justice.